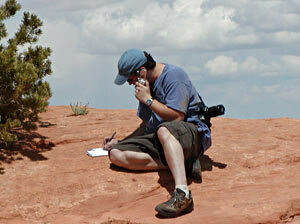 Traction is a must when I'm working on the side of a cliff several hundred feet up, like this one in Moab, Utah on the Metal Masher trail. When was the last time you spent good money on footwear? I mean, you'll spend thousands on parts to upgrade your 4x4 but when was the last time you treated your feet to the same kind of reward instead of buying some cheapo bobos? If you wander the isles at your local mall shoe store or athletic mega-mart you'll find hundreds of shoes that claim to be the cat's meow - and all at a wonderfully affordable price. Then you buy a pair and a month later, they are falling apart, the low-grade "leather" stinks and you're right back in the same shop looking for another pair. It adds up doesn't it? My point is, why buy three or four pairs of wannabe hikers to hit the trails in when you could buy a legit pair that will last a long time and feel great? You buy your 4x4 parts that way, don't you? I've written about LOWA boots before but I felt like it was time to mention them again. It's not often I'll find a product line that I can really stand behind - errr - on - year after year after year. I got my first pair of LOWAs in 1997. I bought them at an outdoor specialty shop because I have very hard-to-fit feet and when I tried the LOWA boots on they fit like slippers. I couldn't say no. Since then I have had many pairs of LOWAs and every single one has lasted me for years. I wear mine every day to work, in the shop, on the trails and when I travel. I have tried other boots and have had not-so-good results. In fact, I have a pair of the Klondike GTX that I got in 2001 that are still in rotation! 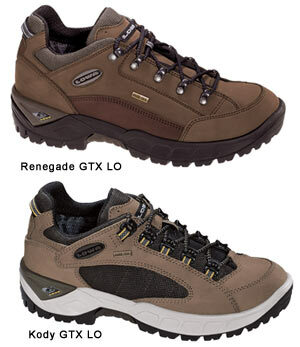 My latest pairs of LOWAs are the Renegade GTX LO (a perennial favorite) and the Kody GTX LO, which I respectfully call "my sneakers." Both models are lighter than a tradition hiker, just as professional running shoes are lighter than their lower-end counterparts. LOWAs are cut wider up front to fit more shapes of feet, which is especially nice for me, since one of my biggest issues in finding a pair of any kind of shoes is finding one that fits right. I also have several pair of high-top boots that I've had for quite a while that I wear on the trails, in the shop, and working around the house. All of my boots have GORE-TEX® lining so my feet stay dry - even when I'm wading ankle-deep in Alabama mud. On our last off-road outing it was so muddy that I couldn't even drive home without washing the boots off. I went to a pressure washer and washed them off while still on my feet. I didn't get a drop of water inside and the boots were dry by morning, ready to wear again! That's what I'm talking about! 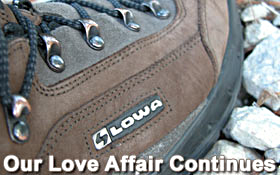 In LOWAs marketing materials they say, "We are not a jacket or tent company that thinks our logo looks good on a shoe." What's that mean? It means that LOWA has been in the boot business for over 80 years. They make boots. That's it. That's all they've ever done. Based in Bavaria, the people who make LOWA boots NEED LOWA boots. The locals know a good boot from a bad one because they use them every day. Unlike other boot or shoe companies, LOWA is committed to making a top-notch product in top-notch facilities. Assembled by hand in Bavaria and nearby Slovakia to EU Green production and safety standards, LOWA boots are at the opposite pole from their competitors who use Asian sweat shops. Yes, that means they cost more, but it also means that they are made right. They fit. They are flawless. They last. So is this just a blatant endorsement of LOWA boots? Well, yes. It is. Why? Because they rock and I believe in them. If you're hitting the trails, give your feet the same kind of consideration you give your tires. You'll be a believer, too.